German historian of literature; born at Hamburg Nov. 27, 1834; died at Carlsruhe Feb. 25, 1897; son of Ḥakam and brother of Jacob Bernays. He attended the Johanneum in his native city, where, principally under the guidance of Adolph Kraft, he devoted himself to the study of the classics. In a performance of "Antigone," arranged at the gymnasium by Töpfer, Bernays appeared as Kreon, and is said already at this time to have excited admiration by the originality of conception revealed in his rendering of the lines. A few months later he entered the University of Bonn, where at first he devoted himself to the study of law, but soon abandoned it for that of classical philology, which, notwithstanding many unfavorable external circumstances, he thenceforth prosecuted with unflagging perseverance. After completing his course at Bonn he went to Heidelberg, where he became a pupil of Gervinus and Holtzmann. Shortly after his arrival there Bernays, although then scarcely twenty-one years of age, lectured on Shakespeare before a literary student society which he had founded, and whose members had bestowed upon him the title of "master." In 1855 he received his doctorate and prepared to qualify himself for a professorship, while at the same time prosecuting his manifold literary labors. In 1859 Bernays published a festival play for the one hundredth anniversary of Schiller's birthday, and in 1864 he composed verses on the tricentennial celebration of the birth of Shakespeare. Shortly afterward he wrote an explanatory text to Beethoven's music to "Egmont," which was not only frequently spoken, but produced so lasting an impression that, thirty years later, the directors of the Carlsruhe Theater ordered from Bernays a similar prologue for Mozart's "Requiem." Despite these occasional literary productions, however, Bernays steadily pursued his studies; and he even refused an offer from Treitschke to participate in the editorship of the "Preussische Jahrbücher," fearing that the duties of such a position might divert him from his main purpose. 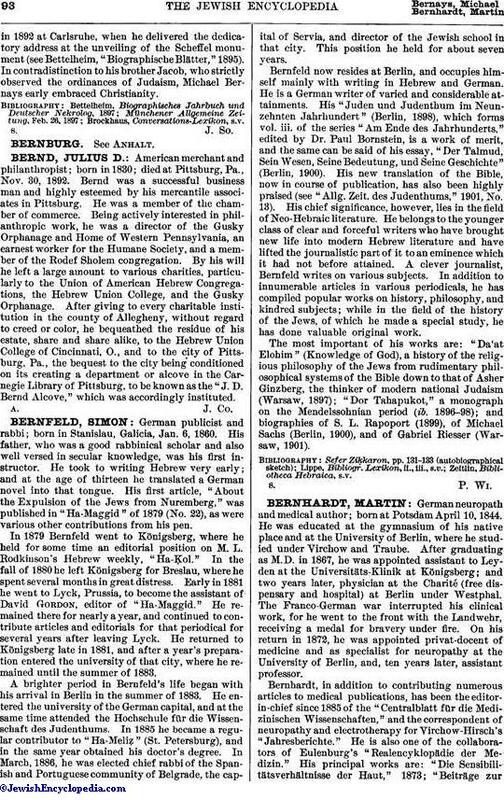 In the same year, 1866, he published his first celebrated work, "Zur Kritik und Geschichte des Goetheschen-Textes," in which he once for all established the necessity of applying the methods of classical philology in the criticism of the modern masters. Shortly after the Franco-Prussian war, which so powerfully stimulated the general interest in the national poetry, Bernays received a call to the University of Leipsic, and such was his popularity as a lecturer there that within a very short time after his arrival the largest hall of the university was inadequate to accommodate the audience. It was the enthusiasm thus aroused that now induced the artloving king of Bavaria, Ludwig II., to found a special chair of German literature—the first to be established—at Munich, and to summon Bernays thither as extraordinary professor, who thus, at the age of thirty-nine, already beheld the fulfilment of his dearest wishes. After an activity of eighteen months Bernays received a regular professorship, and this position he held until his resignation in 1889, when he removed to Carlsruhe. In striking contrast with many university professors, Bernays rarely confined himself to the written copy before him; for he was gifted, above all, with a marvelous memory. It is said that he could recite lengthy poems and dramas, such as "Hermann und Dorothea" and "Tasso," from beginning to end without faltering or betraying any evidence of fatigue. With this faculty, which he had cultivated from early youth, Bernays united an unusually extensive yet accurate knowledge of the literature of ancient and of modern times. Thus he constantly enriched his discourse with copious and pertinent citations reflecting the inmost nature of the author under discussion. When to these qualifications are added a voice of exceptional flexibility and power, and a carefully studied eloquence of gesture, the great popularity of the lecturer can be readily understood. In his published works Bernays aimed to transfer the methods of classical philology to the domain of modern literary history and criticism, and endeavored to elevate these studies to an equality with the other academic sciences. Among his most popular writings, besides those mentioned, are: "Briefe Goethe's an F. A. Wolf," Berlin, 1868; "Zur Entstehungsgeschichte des Schlegelschen Shakespeare," Leipsic, 1872; "Der Junge Goethe"—a collection of the poems and letters of Goethe during the years 1764-76—3 vols., Leipsic, 1875; "Goethe und Gottsched"—two biographies—Leipsic, 1880; an introduction to a revised edition of Schlegel and Tieck's translation of Shakespeare, Berlin, 1871-72; an introduction to a centenary edition of Voss's translation of Homer, Stuttgart, 1881. 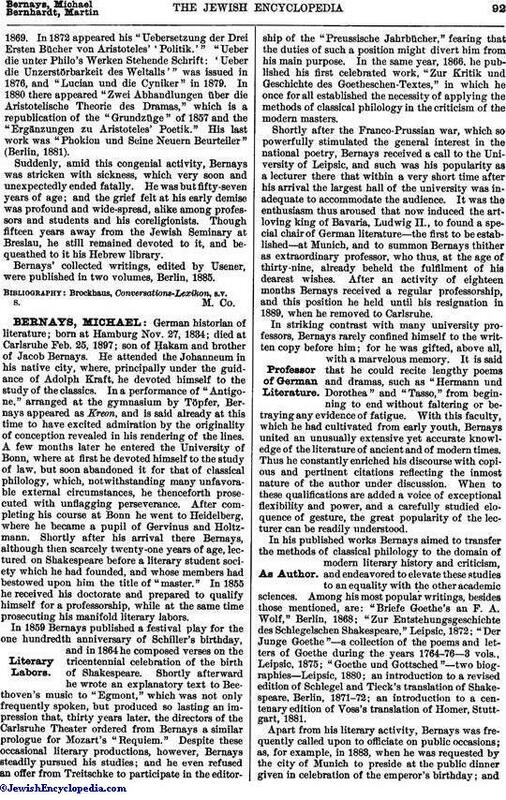 Apart from his literary activity, Bernays was frequently called upon to officiate on public occasions; as, for example, in 1883, when he was requested by the city of Munich to preside at the public dinner given in celebration of the emperor's birthday; andin 1892 at Carlsruhe, when he delivered the dedicatory address at the unveiling of the Scheffel monument (see Bettelheim, "Biographische Blätter," 1895). In contradistinction to his brother Jacob, who strictly observed the ordinances of Judaism, Michael Bernays early embraced Christianity.